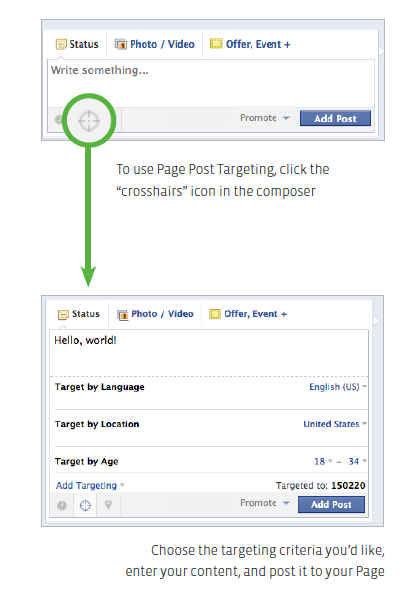 Facebook has launched their NEW posting options called Pages! This feature allows segmenting your audience by certain characteristics such as age, gender, interests, relationship status, language, education, workplace, and location. These new target categories give marketers the opportunity to aim their postings to a certain audience. The advantage is addressing the customers that would be the most interested in a particular product or service. For example, if you were a dating site advertising on Facebook, ads can be targeted toward young and old singles using age and relationship status options.Take a clothing store for example. If women’s clothing is marked down, customize posts by gender and promote your sale specifically to women. By aiming your posts toward a particular audience you have a better chance of engaging your fans toward your posts. For Facebook pages with millions of fans the Pages feature will be much more of an impact for their page than it would be for a small business. Large businesses are having trouble posting information on Facebook and making sure that post is unisexually accommodating to all fans. Segmenting their posts will be a way for these businesses to reach fans that couldn’t normally reach. Is Pages ideal for your business? This change is not for everyone. Small businesses with limited fans may want to avoid targeting a certain audience too often. Due to the minimal viewers the fan page may have to begin with, limiting more fans to that post will have less of an impact. Even if Pages may not be an option to drive traffic towards your Facebook fan page a functional website may be! Contact us for all of your marketing needs and we will work together to find an appropriate solution for your business! Images and research: Social Fresh by Chad Wittman. I still really find it hard to engage people on my page compared to twitter. Social Media Examiner recently blogged this post that provides 9 ways to transform your website into a social media hub. I hope this link proves helpful in your internet marketing efforts.